It‚Äôs 31 Days of Free Music month at Podcasting News. All month, we’re looking at free music podcasts and finding great music, music that fu**ing matters and even a little unrelenting noise. 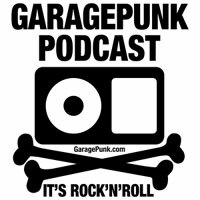 There’s lots of screaming, and it’s rough around the edges, but it doesn’t get more raw, real or direct than the GaragePunk podcast. The GaragePunk Podcast is a network of home-made, low-budget ‚Äúradio show‚Äù-style programs that focus on wild and obscure garage rock, proto punk, surf, R&B, broken blues, powerpop, punk rock, new wave/no wave, noise, and trashy, primitive rock‚Äôn’roll from the past, present, and future. Our show hosts are ordinary people ‚Äî music fans just like yourself. Not professional disc jockeys. We just have an interest in music and culture that is anything BUT ordinary. It’s another example of podcasts featuring music that you’re not likely to hear on mainstream radio.